Love the smell of a fresh brewed cup of coffee but hate the jitters when you drink it? 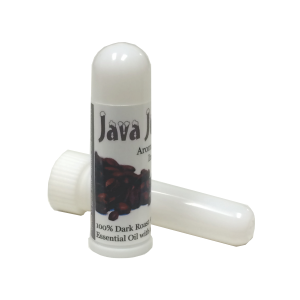 The Java Jump Inhaler may be your solution to giving up your favorite beverage. 100% pure essential oil of dark roasted Arabica bean is blended with a touch of Patchouli to give you all of the deep sumptuous smell of a coffee house brew with none of the side effects of caffeine. Sniff and be satisfied. Product Contains:100% Arabica Coffee Bean Essential Oil and a touch of Patchouli in a base of Golden Jojoba.